These figures were produced from 1973-1974 by Matchbox/Lesney Products. However, traces of them for sale (clearance bins included) went until about 1975-76. The two main characters, Cap'n Hook & Cap'n Pegleg, were produced and sold in stores in the USA and in Europe. The glow-in-the-dark Ghost of Cap'n Kidd figure was sold exclusively by Sears catalogs in the US, but in stores in Europe. 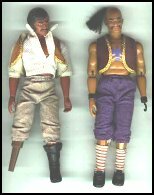 Each figure had a button on the inner left side of their body which allowed for a sword slashing/knife throwing feature in the pirate series, and a gun-drawing action in the lesser-known Western series. The Western series consisted of the same "pirates", but they were disguised this time as cowboys. Each boxed Adventure Set or blister Action Pack contained a great variety of accessories including swords, knives, coins, treasure, hast, coats, guns, etc., etc... Each boxed adventure set also came with a small comic/instruction sheet inside. They are orange and white in color and are the size of a small brochure. These pamphlets gave a brief description of the adventures of Cap'n Pegleg and Cap'n Hook and how these accessories fit into their adventures. The neatest accessory by far was the hollow Pegleg on Cpt. Pegleg's right side. He had a treasure map which actually was rolled up and hidden inside his leg! This in turn was capped off by a small "plug" to contain the map. This map, made of paper, and plastic "plug" are probably the two most hard to find items in loose figures because they generally are lost. The map itself usually deteriorates in time. If you are lucky, you hopefully will find Cap'n Pegleg with his map stil hidden inside of his pegleg. It usually looks like nothing more than a wad of paper up there, and was difficult to get out without destroying it once it was in there. You must patiently and CAREFULLY pry the map out with tweezers or something not very sharp or you will damage the fragile map. I have 3 and learned the hard way. In addition to all of this, it should be noted that these sets came in European boxes which were similar to the US editions, but had multiple languages on the box (English, German, French and Spanish). Other than that, the colors and accessories were the same. There were 2 playsets that these pirates could adventure on. They were both called the Sea Fury, but were quite different. The standard version was sold in stores and was nothing more than a vinyl covered cardboard ship that doubled as a carrying case. The Sears mail order edition however was an ENTIRE sailing vessel with sail, above and below deck, and more. It is worth considerably more, and thus harder to find. These ships came with sticker sets to apply to these playsets. The strength of these figure was in their accessories. Their weakness however was Matchbox's attempt to enter an action figure market already dominated by Hasbro's GI Joe and Mego's various action figure lines. Thus, the overabundance of accesory sets led to multiple packaged accessory kits with the Cap'n Patch figure. He was no more than a cheap knock-off of Mego's Cpt. Patch figure, but his patch is on the other side of his face, and his body is that of a cheap Action Jackson with a backed stamped solely "Made in Hong Kong". He is much different then the more articulated and mobile Cap'n Pegleg, Hook, and Ghost of Cap'n Kidd figures who were stamped "Lesney Products" and dated. He is however a neat variation to obtain and is usually quite inexpensive unless he is mistaken for Mego's variety, who can be quite expensive. Just check his patch (should be on the right eye) and his back, as stated before will be marked solely "Made in Hong Kong". There will be no date and it will also NOT say "Mego".